I submitted a goal on April 8 which I updated on September 3, October 3, and November 10, 2013. Have I made progress on my goal through the action steps? What will I learn if I review my intentions and collect evidence that supports my goal? If I take the time to check in and self-assess, will I be able to determine if I’m on a good path? To purposefully act to forward Trinity School’s mission, faculty-learners and student-learners will grow significantly in their use of reflection and the formative, diagnostic, and self-assessment knowledge that come from such an approach to learning. Intentionally reflect and question to grow and learn. Publicly publish my reflections at Experiments in Learning by Doing. Connect with others by broadcasting each post via Twitter. Reflect on learning by keeping a running record in an e-portfolio. Encourage and provide opportunities and support for others to develop professional portfolios that document learning, growth and reflections. MyLearningEDU 1.5 for teacher-learners to model and experience My Learning from the student perspective. Twitter for Learning for teacher-learners to foster and develop connections with other educators and experts. Leading Learners to Level Up for teacher-learner teams to design and implement formative assessment that diagnoses and differentiates while leading learning. (Added in November) Observation of Practice takes on the task of seeking and gaining perspective. How might we help teachers focus on what is happening in classrooms in a systematic, purposeful and focused way? How might we model and embrace formative assessment of our practice? How might we leverage peer-to-peer assessment and feedback? Shelley Paul (@lottascales) and I have facilitated two more rounds of Leading Learners to Level Up (#LL2LU) for The English Connection at Woodward and for Kindergarten-9th grade math teachers at Trinity, Walker, Woodward, Westminster, and Mount Vernon. We also hosted a conversation at EduCon on writing learning progressions. Our EduCon session was in collaboration with the Martin Institute and was broadcast to seven cities in the US with a total of approximately 140 participants. Broadcasting to multiple sites was a great learning experience. Our site facilitators offered feedback on several areas. Jill’s session was excellent. I’ve had great feedback from Renbrook teachers, especially US teachers from 3 different departments-English, World Language, and Science, who said they can see immediate application of the concept. They felt the presentation was a good blend of instruction and opportunity for collaborative practice. They plan on sharing this concept at department meetings this week. The Lower School teachers who attended will present the concept at a meeting in the near future. Although we got behind schedule given the tech issues, the most informative moment was when our group was working on the creation of examples of LL2LU. Although we thought the task would be simple as we set out to do our work, it actually was more difficult than we imagined. Hence, the “I like,” “I wonder,” and “What if” was very effective. We weren’t able to post many examples given we were behind schedule, but viewing the myriad of postings on Flickr was equally exciting. The group continually shared various findings as they were clicking around the sites. Additionally, we collectively appreciated the “I can” and scaffolded approach to reaching a learning goal. Much to think about here …. Overall we got good feedback from this session. We lost the feed a few times and it was hard to know exactly what was happening at times, but all of the preplanning that Jill and Shelley had done paid off – the lesson plan, agenda, etc helped keep us on track and we were able to continue the conversation even when we lost the feed. There is a new team at Trinity piloting Observation of Practice this month, and I’ve shared the learning plan with interested teams at Westminster and Woodward. Twitter for Learning had a plus this month too. Karen Boykins (@K_Boykins) has requested the next course in the Twitter for Learning series. Karen and Samantha Steinberg (@spsteinberg) collaborated with me to develop a list of essential outcomes for the second course in this series. How exciting to have learners ask for new learning experiences and challenges! I like what I’ve done so far. 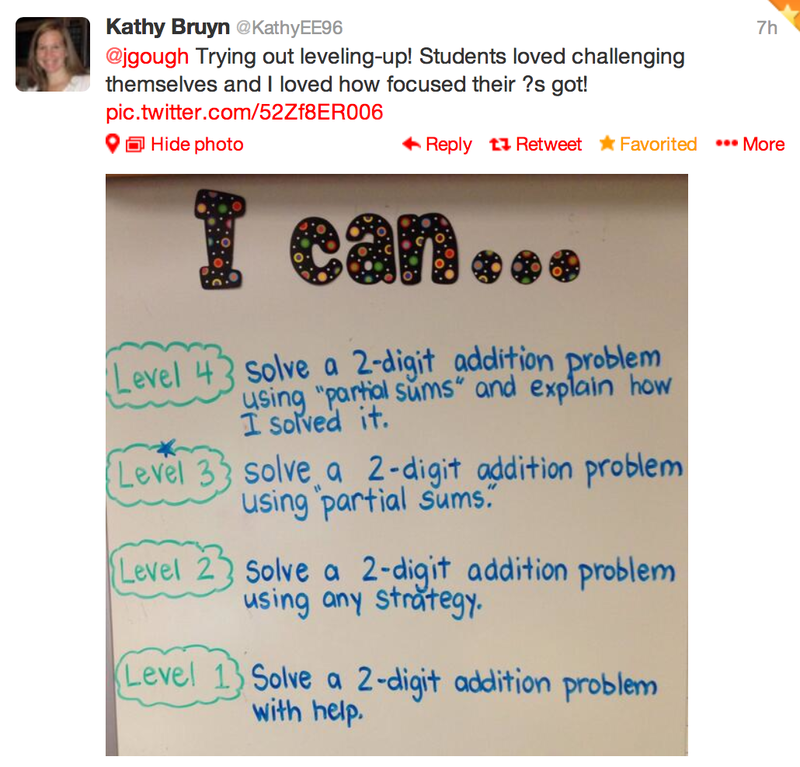 I continue to see products of my action steps in our Faculty’s #TrinityLearns tweets and with #LL2LU participants. 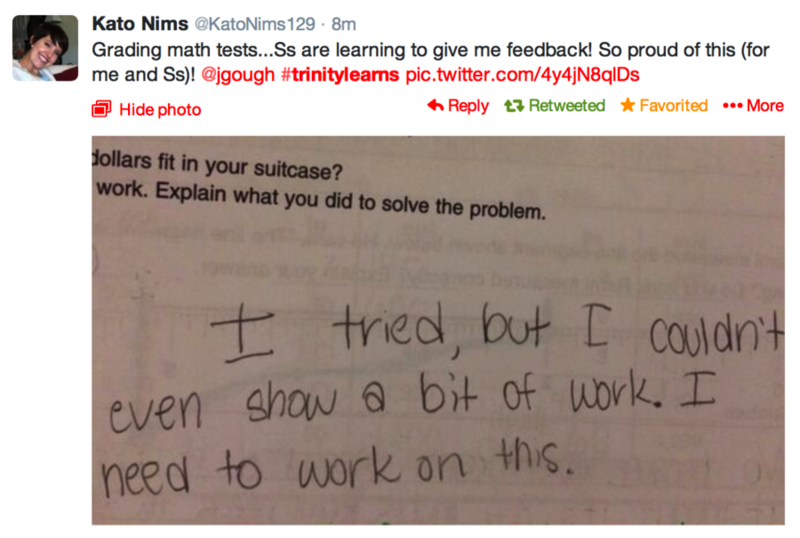 I love this tweet from Kato – a nice mashup of assessment, feedback, and assessment. I wish I could interest and inspire more faculty to participate in MyLearningEDU 1.5. I wonder if I should design MyLearningEDU1.0 as a simpler first step. My to-do list now includes developing and securing PLU credit for Connections and Furthering PLNs in the Twitter for Learning series and developing MyLearningEDU1.0. Have I made small course corrections when needed? What additional action steps need to be added? Developing a goal, a SMART Goal – learner outcomes and action steps. I submitted a goal on April 8 which I updated on September 3, 2013 and reviewed on October 3, 2013. Another month has gone by. Have I made progress on my goal through the action steps? If I take the time to check in and self-assess, will I be able to determine if I’m on a good path? Will I be able to make a small course correction if I’ve gotten distracted along the way because of the busyness of school? What if I review my intentions and collect evidence now that supports my goal? What if I hold myself accountable for making small progress in just one month? Intentionally reflect and question to grow and learn. Publicly publish my reflections at Experiments in Learning by Doing using the tag #MyLearningEdu. Connect with others by broadcasting each post via Twitter. I continue to blog at least once a week. I’ve decided not to use #MyLearningEdu as a category or tag. It doesn’t seem to make sense to me right now to use this tag. I still owe Maggie Berthiaume a couple of comments and tweets. Shelley Paul (@lottascales) and I have facilitated a complete 1-PLU course round of Leading Learners to Level Up (#LL2LU) for The English Connection at Woodward and for math teachers at Trinity and Mount Vernon. We are planning another round of each during the winter. 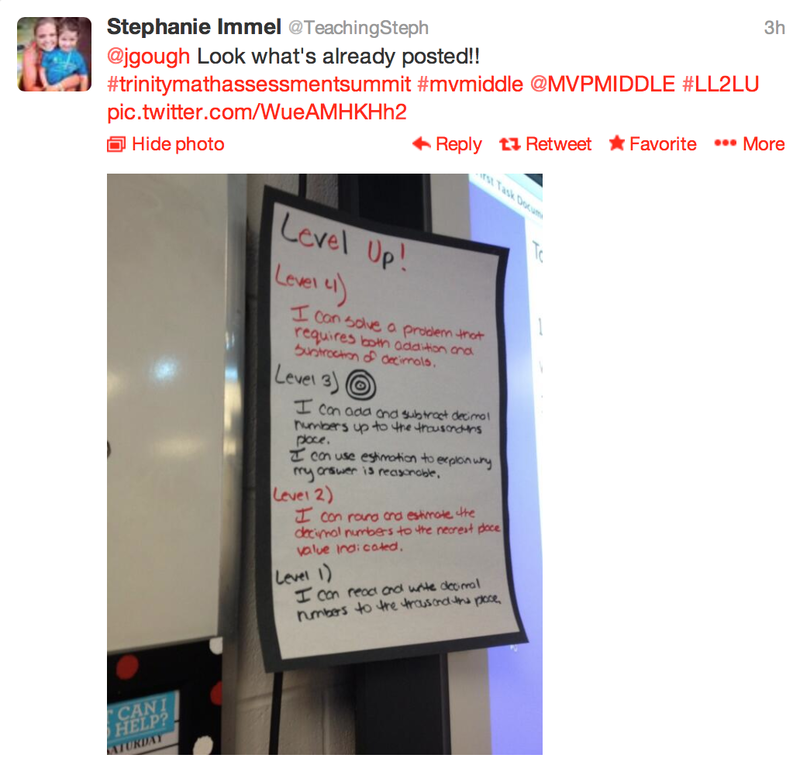 I offered a Leading Learners to Level Up session on learning progressions at Trinity’s October 30 Faculty/Staff Forum. I like what I’ve done so far. I’ve seen products of my action steps in our Faculty’s #TrinityLearns tweets, Kathy and Maggie’s reflections on their blogs, and with the #LL2LU participants. See PD in Action for more stories of application of learning progressions and formative assessment. I’ve also written a new 1-PLU course, Observation of Practice, for our teachers based on the comments of Arleen and Laura after reading my reflection of the class we taught together. They both commented on how helpful it was to see their class from another perspective. Observation of Practice will integrate formative assessment and reflection with peer observation by having each team member reflect. As a result of this observation of practice and feedback loop, which aspects of my teaching do I feel are bright spots? As a result of this observation of practice and feedback loop, what questions do I have about my own teaching? As a result of this observation of practice and feedback loop, what new ideas do I have? I have to say that I find it helpful and motivating to check on my progress each month. Am I intentionally working on my goal? Am I making progress? Have I made small course corrections to get back on track when I find myself distracted by other important work? I’d love your feedback on any part of this process. Your questions and comments will help me learn and grow. I submitted a goal on April 8 which I updated on September 3, 2013. Another month has gone by. Have I made progress on my goal through the action steps? If I take the time to check in and self-assess, will I be able to determine if I’m on a good path? Will I be able to make a small course correction if I’ve gotten distracted along the way because of the busyness of school? What if I review my intentions and collect evidence now that supports my goal? What if I hold myself accountable for making small progress in just one month? There are two teacher-learners working through the MyLearningEDU 1.5 course. I might need to step up my game on commenting on their posts. I have commented on and tweeted out Kathy Bruyn’s posts, but I owe Maggie Berthiaume a couple of comments and tweets. Their blogs are awesome if you have not looked at them. These blogs are very different, and I learn from both. There are 20 teacher-learners officially participating in Twitter for Learning with many more participating unofficially. Evidence of their reflection and learning can be found at #TrinityLearns, #WALearns, #WalkerLearns, and #CDSLearns. Mark Silberberg (@SilberbergMark) and his team are also participating using #LREILearns. Shelley Paul (@lottascales) and I have facilitated Leading Learners to Level Up (#LL2LU) for The English Connection at Woodward and for math teachers at Trinity and Mount Vernon. Kate Burton and I have tinkered with #LL2LU for risk-taking and persistence and tenacity. I am using #LL2LU as a tag for these posts. I like what I’ve done so far. I wonder if I’ve done enough to encourage and motivate others to develop professional portfolios that document learning, growth and reflections. I wish I could make this seem easier. What if I become more intentional about modeling the #LL2LU method of formative assessment by applying the leveled self-assessment rubric for Twitter for Learning? To see the development of this goal, see iterations Goals and Self-Assessment – Updated September 2013, Goals and Self-Assessment April, 2013 and Developing a goal, a SMART Goal – learner outcomes and action steps. I know more now than I did in April and I find that it is necessary to revisit and revise my goal. I submitted a goal on April 8 which I’ve now updated (as of September 3, 2013). The above shows how I submitted my goal; the design and images are important to me. The hyperlinks are now active in the document above, which was not the case in April. Strategic: Publishing a minimum of one reflection per week will model and practice reflective teaching practices that mirror the reflective learning practices we expect from My Learning student portfolios. Measurable: Success will be measured in several ways. Will we publish meaningful reflections every week? Will we enhance others learning by commenting on reflections and/or by sharing the reflections with others? Will faculty-learners embrace the My Learning philosophy and model reflective practices for student-learners? Attainable: Every journey begins with a first step. Reflection on practices occurs every day. Publishing reflections every week is the target. If a stumble occurs (a missed week), there is always the next week to recover and try again. It is an iterative process. Results-oriented: Portfolios support a growth mindset by allowing learners to track their learning and growth over time and offer opportunities to modeling networked learning and develop community partners. Time-bound: We expect our student-learners to reflection on their learning periodically throughout the entire school year; therefore, the goal is to publish at least one reflection every week during the 2014-2015 academic year. To see the development of this goal, see previous iterations Goals and Self-Assessment April, 2013 and Developing a goal, a SMART Goal – learner outcomes and action steps. Submitted on April 8, 2013. The above shows how I submitted my goal; the design and images are important to me. The hyperlinks are not active in the document above, so I’ve included all text below. When asked what I do, I either say that I serve as connective tissue or that I am an idea girl. I am intentional about serving as a bridge. I am also committed to modeling what we want to see in our school. Actions speak so much louder than words. I think (and hope) that I succeed more than I fail. To that end, I have set out to model using our learning spaces to engage faculty in learning experiences that are active, hands-on, and use technology in adaptive and transformative ways. I work to model seeking feedback, sharing feedback, and using feedback to learn and grow. Serving as connective tissue gives me great joy. If our schools believe communication and collaboration are important, how are we modeling this for our community? Being an idea girl soothes and feeds me as a teacher-learner. I want to risk, struggle, learn, and belong. As evidence of this bridge work, connective work, and idea work, please see the following stories and reflections of my learning. Attainable: Every journey begins with a first step. Reflection on practices occurs every day. Publishing a reflections every week is the target. If a stumble occurs (a missed week), there is always the next week to recover and try again. It is an iterative process. Intentionally reflect and question to grow and learn. Publicly publish my reflections at Experiments in Learning by Doing using the tag #MyLearning. Connect with others by broadcasting each post via Twitter. PLuGIn: SynergyEDU 1.0 for teacher-learners to experience collaborative problem-finding and problem-solving. To see the development of this goal, see my previous blog post.